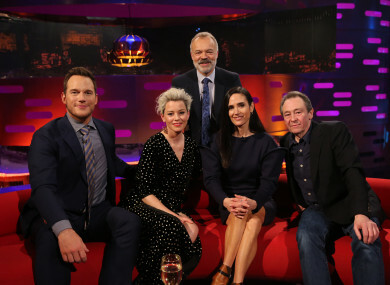 Tonight Graham Norton’s couch will host Chris Pratt and Elizabeth Banks, who are promoting The Lego Movie 2: The Second Part, while Oscar-winning actress Jennifer Connolly will be on to chat about her new sci-fi action movie Alita: Battle Angel. Actor and comedian Paul Whitehouse will also stop by to talk about Only Fools and Horses, a musical based on the TV show, in which he plays Grandad. There’ll be a musical performance from Chaka Khan, and the usual cringey tales from audience members in the red chair. On tonight’s Late Late Show, Ryan Tubridy will be sitting down for a chat with Room To Improve star Dermot Bannon, impressionist Conor Sketches and Galway Hurling Davy Glennon. He’ll also have a chat with Gillian Quinn, who left school at the age of 14 to move to England and never returned to education. When she saw her husband Niall Quinn receive an honorary degree some years later, she was inspired to return to college. Tonight she’ll share her story and prove that it’s never too late to go back and get an education. Whether you love Vicky or hate her, this documentary has been the talk of Twitter all week, and if you’re going to take a side in the debate, you’ll wanna watch this. Geordie Shore star Vicky Pattison gives an intimate glimpse into her life in the aftermath of her sudden break up with John Noble, caused by his alleged infidelity. In Summer 2017, it was announced that The L Word would be making a comeback, for better or for worse. Since this huge announcement, there’s been very few updates on the series. Until now, that is. Everybody’s also talking about… Louis Theroux’s new documentary on consent and sexual assault. In Louis Theroux’s next BBC documentary, the filmmaker is travelling to America to explore the ongoing consent debate in American universities. Over the last few years, universities have put guidelines in place to protect students from being assaulted, but some have argued that this can result in unnecessary punishment for behaviours that aren’t considered criminal offences. Jamie and Jimmy’s Friday Night Feast (Channel 4, 8pm) Jamie Oliver and Jimmy Doherty bring back fond food memories for guest star Patrick Stewart in tonight’s episode, tracking down the restaurant in which the Star Trek actor first fell in love with Mexican food 30 years ago. Live Six Nations Rugby Union (Virgin Media One, 7pm) France v Wales (Kick-off at 8pm). Coverage from the State de France in Paris with commentary from Alan Quinlan and Dave McIntyre. Ronan O’Gara: The Big Interview (Virgin Media One, 11.30pm) Ronan O’Gara talks to Joe Molloy about his five seasons spent living and coaching in Paris and Christchurch since retiring from playing with Ireland and Munster. Donncha O’Callaghan: Game Over: True Lives (Virgin Media One, 10.30pm) The Munster rugby star and former Irish international revisits the experience of his retirement from the game, from the emotional impact to the harsh reality of dealing with a change in pay. QI (BBC Two, 10pm) Josh Widdicombe, Cariad Lloyd and Paula Sinha join regular panellist Alan Davies, as questionmaster Sandi Toksvig considers various phenomena. Shipwrecked (E4, 5pm) The Tigers are not aware of a mole in their midst. Kalia is still unsure about Harry’s feelings, and there’s a dramatic beach party for the new arrivals where the other islanders are given a chance to swap islands.